November 2011. 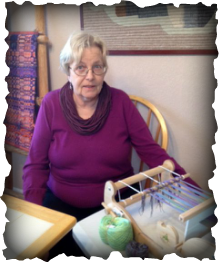 My mom with her first weaving project. _Learn to make your own "Kreations"! at my studio in San Marcos, Texas, Tu-Sa 10am-4pm, by appointment. 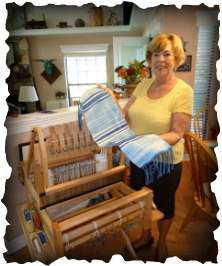 I also make house calls for lessons, if you have a loom that's not portable! February 2012. Another proud student. Cricket Club. First Tuesday of every month. 10am-noon. Please email to join the group.